Your feline friend will be purring with joy over the delectable taste of Solid Gold Five Oceans Shrimp and Tuna Recipe Canned Cat Food! Loaded with vitamins and minerals, this grain and gluten free wet cat food provides the complete and balanced nutrition your kitty deserves. It also contains taurine which helps to support healthy vision and a strong heart for cats, and may contribute to normal growth and development for kittens—making this cat food purr-fectly suitable for all life stages! 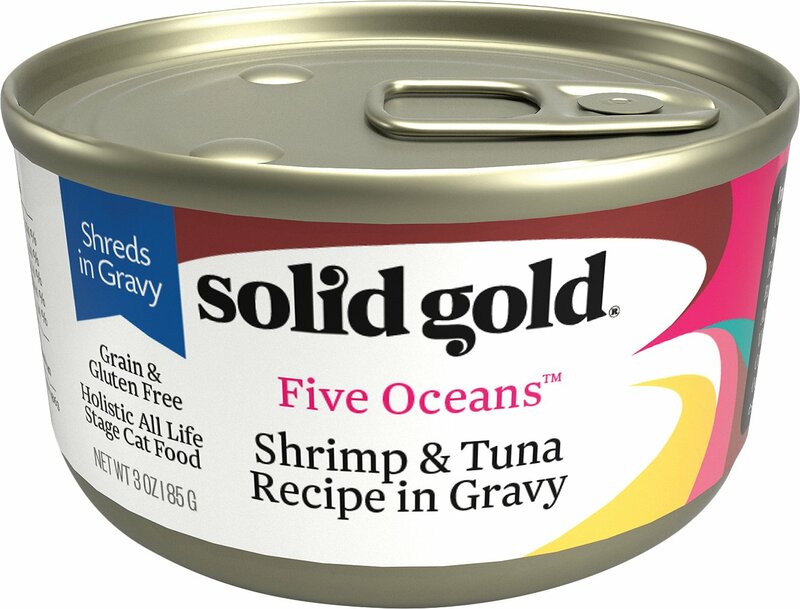 With shrimp and tuna listed in the top 3 ingredients and marinated in a tasty gravy, this Solid Gold cat food is certainly as good as gold! 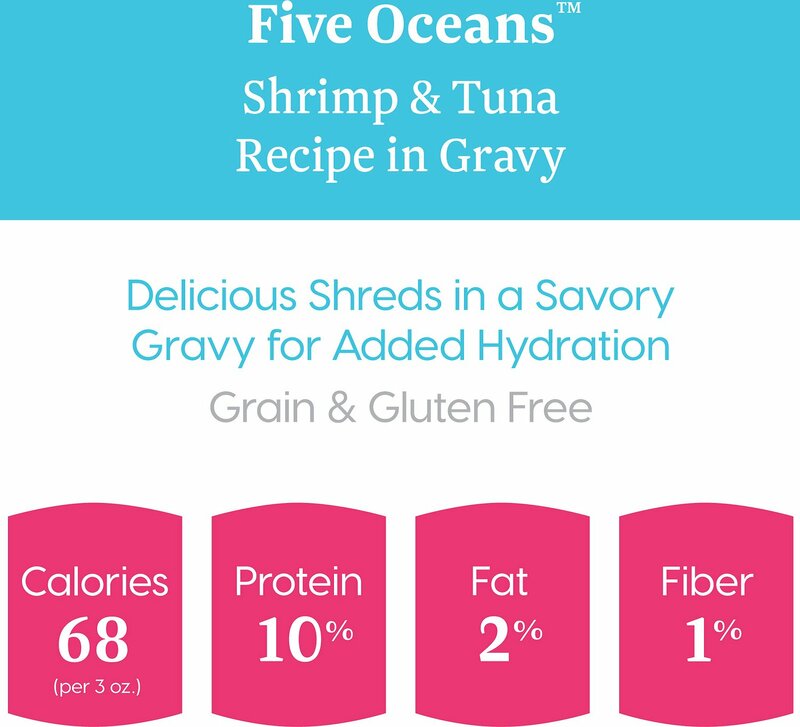 Contains real shrimp and tuna because your furry friend deserves nothing but the best. Vitamins, minerals and taurine provide your cat with the complete and balanced nutrition she deserves. Suitable for all life stages from kittens to cats. Delectable gravy marinade pairs purr-fectly with your kitty’s favorite kibble. Contains no gluten, grains, added sugars, fillers, by-products, artificial coloring, flavoring or preservatives. Feed kittens up to 2 times and pregnant/lactating cats up to 3 times the normal Adult amount. Provide fresh water for your cat at all times. Refrigerate unused portion. Switching to any new dog food should be a gradual transition over 7 - 10 days. 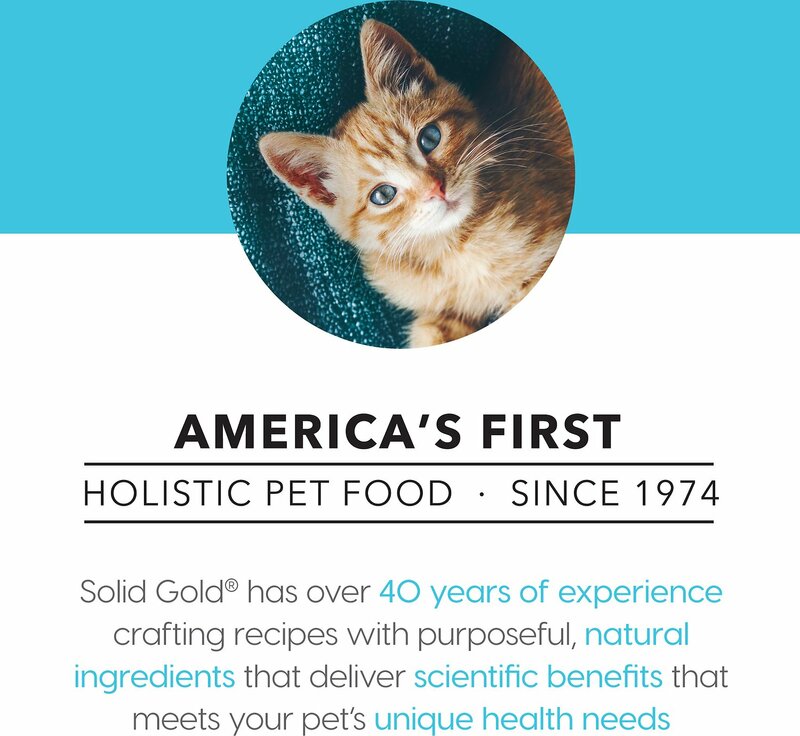 Replace 25% of the current food with Solid Gold pet food for 2 to 3 days, then feed a little more Solid Gold pet food over the next 5 - 7 days until they are eating a Solid Gold formula exclusively. This gradual transition will help reduce any digestive upsets that may occur due to the change in diet. 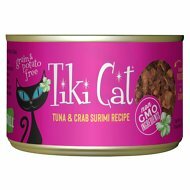 Our tuna based canned cat foods are made in Thailand in facilities that manufacture human consumption tuna and meet our high quality and safety standards. Canned foods should be covered and stored in the refrigerator for no longer than 3 - 4 days. All 3 will nibble at this one. And eventually, as their bellies grow more hungry, they come close to finishing it. But it did seem more out of pure hunger than tasty enjoyment. I will keep feeding them the rest of this case. But the other Solid Gold formula - tuna - is going to the shelter. 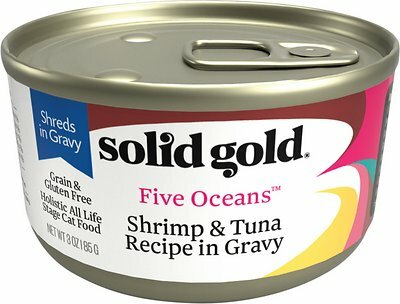 I appreciate that this food actually has more than 1 or 2 shrimp in the can and my kitten does too! I can say 1 out of four cats liked it. I had only one cat like this one. All four like the tuna one but this was a no for the majority. It is great quality and I will definitely be buying more from this brand. Both of my cats really like at least two of the Solid Gold wet foods. Of course not the same cans so I can’t save money and by buying the big cans, but I love my cats so they get the good stuff. My cats kind of ate around the shrimp. Looked great: little tiny real shrimp with some pate like around it. Unfortunately, my kitties didn't eat a lot of it. Tuna's OK, but All Cats HARD pass on the shrimp! Even the local strays we feed, eat around the shrimp and leave them behind as reminders that even they have things they will not eat! My cat absolutely loves Solid Gold, and I do too! You can actually see fish chunks in their food! I was not expecting the shrimp in this to be whole little shrimps that feel kinda tough. Despite my feelings for it I thought my kitties would love it. Unfortunately they did not. My little guy eats everything around the shrimp so that is only half the food. My big girl that will eat anything was not thrilled about it either. Worth a try though. My King Diamond loves this brand very much. It is very nutritious. It is the only brand he can eat because he has digestive issues. My cat loves the tuna but to mix it up a bit i purchased the Tuna with Shrimp and she LOVES it!! She cannot get enough of it!! Thank you Chewy for carrying Solid Gold cat food!! Not available here in the retail stores at all! !